By Alysha K. Vartevan, D.O., Steven DePrima, M.D. A 42-year-old man presented with progressive myelopathy, abnormal gait, lower extremity weakness, and urinary incontinence. An MRI of the thoracic spine (not shown) demonstrated diffuse cord T2 hyperintensity and prominent enhancing perimeduallry veins, suggesting a vascular malformation with cord hypertension. A cervical spine MRI showed an enlarged vessel along the medulla and upper cervical cord (A). 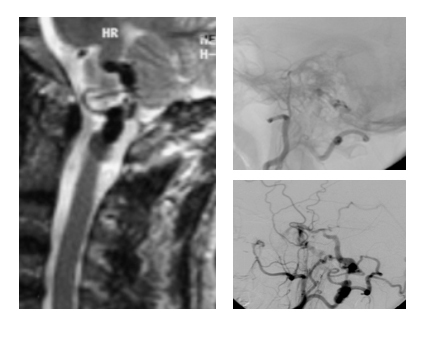 Digital subtraction angiography demonstrated a posterior fossa DAVF fed by branches of the left occipital artery (B) and an enlarged ascending pharyngeal artery (C) with perimeduallry spinal venous drainage (Cognard type V DAVF). Transarterial embolization utilizing coils and alcohol resulted in successful occlusion of the DAVF (not shown). Cognard type V is rare and considered aggressive because of the spinal symptoms related to cord hypertension caused by arteriovenous shunting. Endovascular treatment with transarterial embolization, transvenous embolization, or a combination of both is the mainstay for therapy with favorable results. Gandhi D, Chen J, Pearl M, et al. Intracranial dural arteriovenous fistulas: classification, imaging findings, and treatment. Am J Neuroradiol 2012; 33:1007-1013. Cognard C, Gobin Y, Pierot L, et al. Cerebral dural arteriovenous fistulas: clinical and angiographic correlation with a revised classification of venous drainage. Radiology 1995;194:671-680. Vartevan AK, DePrima S. JAOCR at the Viewbox: Dural Arteriovenous Fistula (DAVF). J Am Osteopath Coll Radiol. 2018;7(2):19. Alysha K. Vartevan, D.O., Steven DePrima, M.D. Dr. Vartevan is with the Department of Radiology, Barrow Neurological Institute, Phoenix, AZ and Dr. DePrima is with the Department of Radiology, Larkin Community Hospital, Nova Southeastern University, South Miami, FL.